2x4 LED parabolic 18 cell light fixture with 2 LED 18 watt lamps included is an office light that reduces glare and saves energy. It's LED lamps will provide an equal amount of light compared to a fluorescent. The parabolic louver upgrades the appearance of any office area. It's easy to get the LED lighting you want for your space and not have to change lamps for many years. It comes in a choice of light bulb colors making it perfect for any interior color design you might have. Whether you are doing new construction or doing a retrofit of an existing ceiling, this is a good choice for the light control but also for its energy efficiency. And if you're doing some offices in phases, then these will match up well with the existing fluorescents you may be replacing now. Many people like the idea of having actual LED light bulbs in this type of light fixture. It gives them flexibility for the future in case they ever want to move to something that happens to be more energy-efficient down the road. All you have to do is just replace the lamps later on, but keep in mind these are designed for LED lamps with a direct connection to power, there is no ballast or driver outside of the bulbs. This particular one has two bulbs for people that want to save maximum energy saving only consuming 36 watts. It will give you a little fewer light obviously, but for many office spaces, they don't need any more light than this. You can expect 50,000 hours of life on the LED light bulbs themselves ensuring that they're going to work for many years to come. 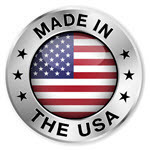 The fixture comes with a five-year warranty so it will protect you against any defects or early failure. The parabolic aluminum louver shields the light at offending angles making it a more comfortable light for office lighting and anywhere you have a computer screen. It's one of the most popular choices for an office light and has been used for many years, except now it has more energy efficiency with LED. Additionally, this is DLC listed so what qualifies for many rebate programs that utilities have as an incentive to switch to more efficient lighting. The most economical, practical and user friendly series of LED fixtures with the energy savings, quality of light, long life and hassle-free maintenance. EZ LED fixtures are UL Listed with the latest LED T8 bypass lamps. Fixtures provide over 44% energy savings over comparable fluorescent fixtures utilizing fewer expensive fixtures than the fluorescent version (no ballast required) and have flexibility to change wattage and color temperature any time. Fixture performance will evolve over time with the evolution of the T8 LED lamp technology. 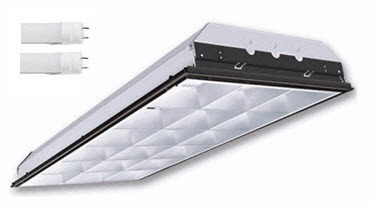 Concerned about maintenance with an LED array and driver fixture? EZ LED solves that by utilizing a self contained LED lamp that fits into fixture just like a fluorescent lamp.